View Oberon's most popular enclosures and mounting solutions for Cisco APs by selecting your AP model below. See all available Oberon products via the "Products" menu item. 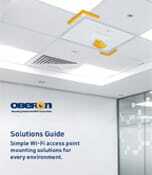 Oberon, a Cisco Solution Partner, is the leading supplier of enclosures and mounting solutions for Cisco access points. Oberon products provide physical security, environmental robustness, aesthetic installation, and optimal wireless performance for your Cisco wireless network.